The landscape of the Blackdowns NCA is very complex and varied mosaic of habitats and landscape features giving rise to a comprehensive list of priorities within the Priority Groups for the area. It is the intention of the Group to deliver the top priorities to varying degrees depending on the suitability of the farm enterprise of the individual member. The Group have potential to deliver on the main Priority Habitats for maintenance represented within this area of the NCA. These being the grassland habitats, maritime cliff and slope, traditional orchards, ancient and native woodlands and riparian habitats. 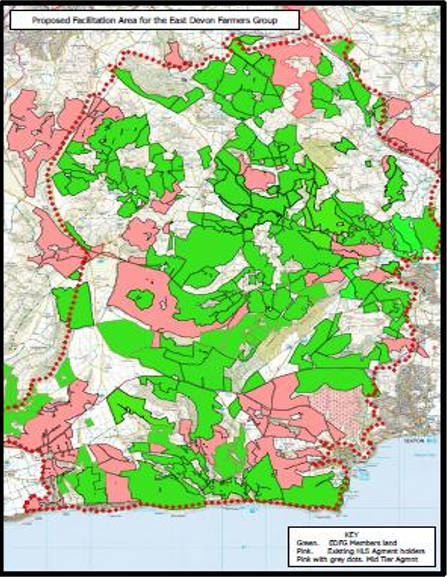 We will address five of the six priorities for restoration as there is no lowland heathland within the proposed facilitation area. With regard Priority Species there are significant populations of greater and lesser horseshoes and a significant proportion of a grey long-eared maternity roost sustenance zone falls within our proposed area, the remainder being within the Axe flood plain in an existing HLS agreement or adjacent to the Axe River SAC. There are also records of small pearl-bordered fritillary, wood white and brown hairstreak the other species are not represented in the southern area of the Blackdown NCA. The majority of the area is a high priority for water quality targets, identified for phosphate, nitrate and sediment, with the exception of Branscombe which contains some specific flood risk issues. The plateau area is particularly rich with both SAM and Shine monuments, undesignated traditional farm and non domestic buildings are abundant across the entire area. A large portion of the area is a FC Woodland into Management target area. The woodland includes PAWs sites and Ancient Woodland sites. With opportunities for planting for biodiversity, water quality and flood risk. The top priorities for landscape in this area are hedgerow and bankside features which will feature heavily in the delivery for the Biodiversity priorities. The River Axe catchment is identified as a key location for this approach; a significant part of our Facilitation Area is within this catchment.